1. Central Catholic (5-0) – CC should be able to cruise through Mt Hood Conference play. They disposed of Reynolds 41-14 with Cameron Scarlett continuing to prove he may be the top Junior in the state, and Holden Oglesbee stepping up at WR catching 2 TD’s. 2. Tigard (5-0) – Typically this game is for the league title, but the Tigers are just head and shoulders above everyone right now. There is a good chance the starters may not play in the 2nd half all year during Pacific Conference play due to blowouts. 3. Southridge (4-1) – The Skyhawks are now firing on all cylinders with Devin Martinez & Jake Pruit being two of the best backs in the state, and QB/WR AJ Woodin and Jordan Morgan doing their thing. Southridge hammered Beaverton 35-7 as the D is also back healthy. 4. Sheldon (3-2) – The Irish were fresh off their first conference loss in the last 7 years to North Medford and showed up looking good to play South. Yadie Dunmore went for 250+ and Sheldon wasn’t messing around in their 49-14 win over S.Medford. 5. Jesuit (3-2) – The Crusaders showed how dangerous they could be destroying an undefeated Sunset team 62-20. Alfieri went for 330+ and 6 TD’s with Chase Morrison adding two. They will play an upstart Westview team that has looked great thus far led by young 6-4 QB Austin Brisbee. 6. Clackamas (5-0) – This will be another battle as every week in the TRL is a toss up. Clackamas showed up last week and got up early on Lakeridge, holding them off 33-21. Dan Sherrell and Louie Germain are currently in a dog fight for conference player of the year honors, as both of them have gone off statistically. Look for this game to be very close. 7. Canby (3-2) – One wonders what the Cougars will do, with all everything athlete Sam Bodine going down for the year with a leg injury. Give Canby a lot of credit fighting back to win last week’s ball game without him. I don’t know if Ive ever seen a kid that’s more well liked the Bodine, as the team rallied to beat a good O.C. squad 20-15. It will be very tough to go into Lake Oswego and win. 8. West Linn (3-2) – The Lions did what no one else could do, ending Lake O’s 48 game conference winning streak. The combination of QB Hayden Coppedge and RB Louie Germain will be key moving forward, as they both possess unique intangibles that put the Lions in the TRL title hunt. 9. Oregon City (4-1) – O.C. is good and just getting better as their talented younger athletes are just gaining more experience. Last weeks loss was tough, but in no way defining as the Pioneers could very well make a post season run. 10. Roseburg (5-0) – The Indians didn’t play great last week, but they continue to win. South Eugene is much improved losing 34-21. Expect Roseburg and North Medford to play one of the better games of the year in the SWC, if they can get by South. 1. Sherwood (5-0) – The Bowmen are dominant enough that all of the backups get plenty of reps, gaining valuable experience in the process. 10 Sherwood RB’s scored this past week, with top rusher Keegan Lawrence adding 3 in their 62-12 win over Liberty. 2. 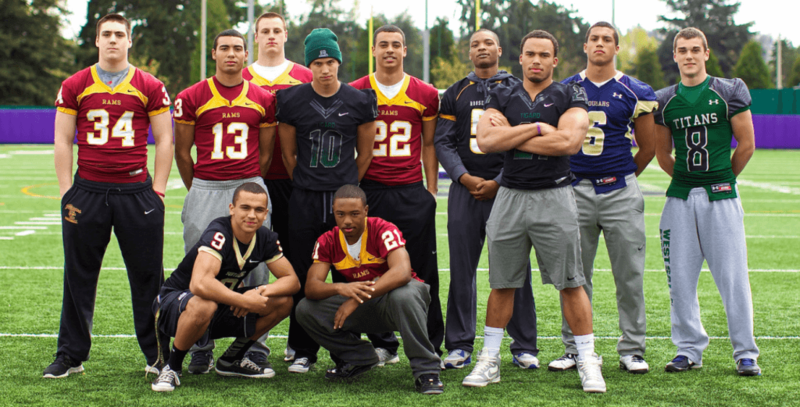 West Albany (4-1) – Check out the defensive performance of the year. The Bulldogs D came to play accumulating 9 sacks, (5) alone from Alex Boyd. West shut out a Silverton team that was averaging 42.5 points per contest, as Jake Lacoste scored both Td’s in their 13-0 win. 3. Silverton (4-1) – The Foxes are a very talented team and could very well make state title run. Jr standout QB Cole Chandler was harassed all night by Bulldog defenders and could never really get going. Look for Silverton to come back strong. 4. Ashland (5-0) – The Grizzlies pulled out another thriller in a game that will most likely decide the conference title. Sophomore standout Sashi Penn found the end zone a couple times with Junior TE/LB Parker Layton doing a little of everything. QB Danial White had 17 carries for 122 yards and 3 Td’s in their 34-28 win. 5. Springfield (3-2) – The Millers are a good football team and just getting better. Ashland is tough place to go in and win especially right now with all of their momentum. Sophomore QB Trever Watson is the real deal and returning co conference player of the year Taylor Travess had 8 catches for 132 yards and 2 total Tds in the 34-28 loss. 6. Marist (3-2) – The Spartans are young and will just continue to get better. Close losses to West Albany and Ashland could go the other way if they meet in the playoffs. Marist hammered Willamette 46-0. 8. Hermiston (4-1) – The Bulldogs hammered The Dalles 51-0 as Hermiston will play a defining game this week against a very tough Springfield team. 10. Mountain View (3-2) – The Cougars got back on track beating a good Wilsonville team 26-13. Senior RB Keenan Springer rushed 22 times for 162 yards and 2 TD’s in the win.